Last Wednesday my Urban Agriculture class and I were fortunate enough to go to an organization called Boston’s Best Bees . It was another hot summer day, as we have been seeing here in Boston all summer long. Our professor had asked us to wear long sleeves; a shirt with a collar, long pants and closed toed shoes. Now, I am not the biggest bee fan out there. While I know we are going through a decline of honeybees that could be detrimental to our way of living, I am still afraid of bees, and would rather not be near them. When I was a child I was playing tag with my older brother, and I was running right behind his friend. This friend stepped on a wasp’s nest, but I got the brunt of the stings. These wasps flew up my clothes and stung me over and over again. Now wasps are very different from bees as we learned at Boston’s Best Bees, but anything that can sting you is not my friend. On this hot summer day however, I was extremely excited to see how honeybees can be of use right here in the city. I knew I had to get over my fear to get the full experience of our field trip. Founded in 2010 by Noah Wilson- Rich while he was pursuing his Ph.D at Tufts, this company’s vision is to bring honeybees to the city, manage bees for private residents and business throughout Massachusetts. It is the only local organization that manages the bees for the owner without taking any of the products from those hives. Best Bees is purely interested in the research they obtain from managing hives and how they can improve bee health. 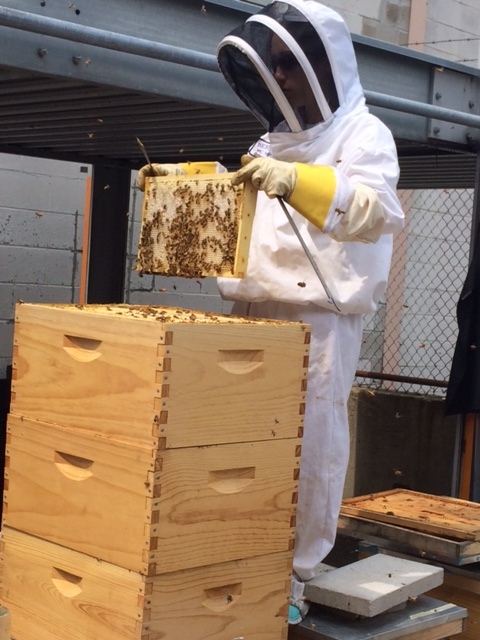 Boston’s Best Bees has clients all over the city of Boston, and in the surrounding suburbs. Their client list includes private homes and apartments, businesses that include hotels and restaurants, professional landscape companies as well as schools and museums. In 2007 American beekeepers began reporting that there was something wrong with their honeybees. They reported that there was a high rate of colony losses that year. This problem spread to other countries as well, and researchers began to try and understand the causes of these losses. Honeybees are extremely influential pollinators, pollinating over 130 crops worldwide. They help increase garden crops in quality and quantity. They of course also provide sweet honey for people to enjoy. It would be detrimental to the life cycle of plants and animals if honeybees were to become more endangered than we are already experiencing. After arriving at Boston’s Best Bees, I was blown away by their location. I don’t know what I was expecting, but this organization is located in a garage with bees flying freely all over their casual office. Who would have thought that such a large number of bees could be right here in our city, not contained, free to fly where ever they chose. Of course, the hives were located outside in their parking lot, but the number of bees inside was astonishing. I’ve always thought of myself as part city girl, and part country girl, growing up in the city but spending my summers in Maine. I just never thought those two worlds could come together and exists in one place. 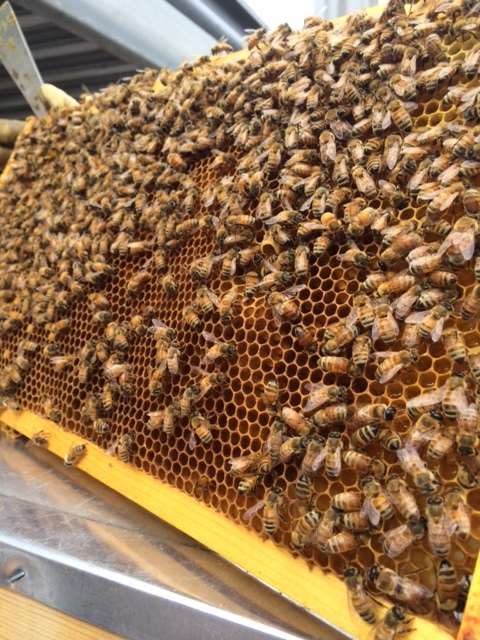 It excites me that Best Bees has so many clients and that there are so many bees being kept to help pollinate our city! I feel strongly that rural areas and large cities don’t have to be drastically different. In the introduction of City Bountiful, Laura Lawson stated that it is important “to train and facilitate urban dwellers in agricultural and rural occupation.” I would agree with this author, that we can and need to cultivate city land to produce local products. While community gardens have been popular for many years now, popping up at schools and vacant lots around cities across the country, other forms of local products such as honey is peaking people’s interests. Beekeeping is increasing in popularity with help of the local food movement and is just another step in bringing rural practices to urban areas. 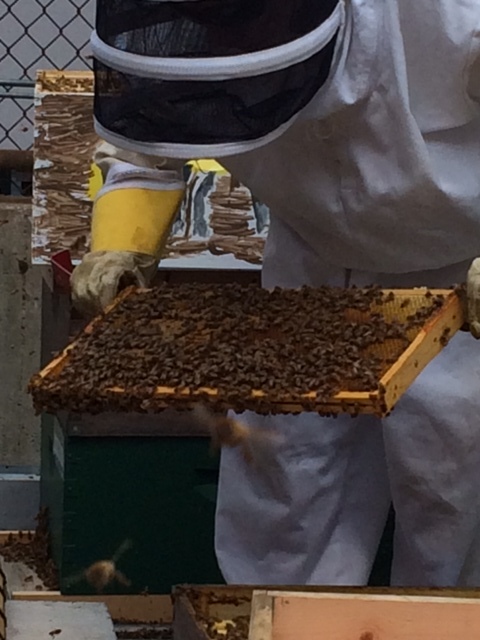 Our class visit to Boston’s Best Bees Company was eye opening and extremely rewarding. It was great to see another angle of this sustainable food movement that is going on in our cities. I would highly recommend anyone interested in local food, the loss of bee colonies, honey production or honestly anyone to go to Boston Best Bees Company. Lawson, Laura (2005) City Bountiful: A Century of Community Gardening in America. University of California Press.